When an exception can occur? An Exception can be anything which interrupts the normal flow of the program. When an exception occurs program processing gets terminated and doesn’t continue further. In such cases we get a system generated error message. The good thing about exceptions is that they can be handled. A Java Exception is an object that describes the exception that occurs in a program. When an exceptional events occurs in Java, an exception is said to be thrown. The code that ‘s responsible for doing something about the exception is called an exception handler. Exception can occur at runtime (known as runtime exceptions) as well as at compile-time (known Compile-time exceptions). Errors indicate serious problems and abnormal conditions that most applications should not try to handle. Error defines problems that are not expected to be caught under normal circumstances by our program. For example memory error, hardware error, JVM error etc. If an exception is raised, which has not been handled by programmer then program execution can get terminated and system prints a non user friendly error message. Exception handling allows us to control the normal flow of the program by using exception handling in program. It throws an exception whenever a calling method encounters an error providing that the calling method takes care of that error. It also gives us the scope of organizing and differentiating between different error types using a separate block of codes. This is done with the help of try-catch blocks. Unchecked exceptions are not checked at compile time. It means if your program is throwing an unchecked exception and even if you didn’t handle/declare that exception, the program won’t give a compilation error. Most of the times these exception occurs due to the bad data provided by user during the user-program interaction. It is up to the programmer to judge the conditions in advance, that can cause such exceptions and handle them appropriately. All Unchecked exceptions are direct sub classes of RuntimeExceptionclass. Runtime Exceptions are also known as Unchecked Exceptions as the compiler do not check whether the programmer has handled them or not but it’s the duty of the programmer to handle these exceptions and provide a safe exit. These exceptions need not be included in any method’s throws list because compiler does not check to see if a method handles or throws these exceptions. You can also create your own exception sub class simply by extending java Exception class or RuntimeException class. You can define a constructor for your Exception sub class (not compulsory) and you can override the toString() function to display your customized message on catch. Extend the Exception class or RuntimeException class to create your own exception class. You don’t have to implement anything inside it, no methods are required. 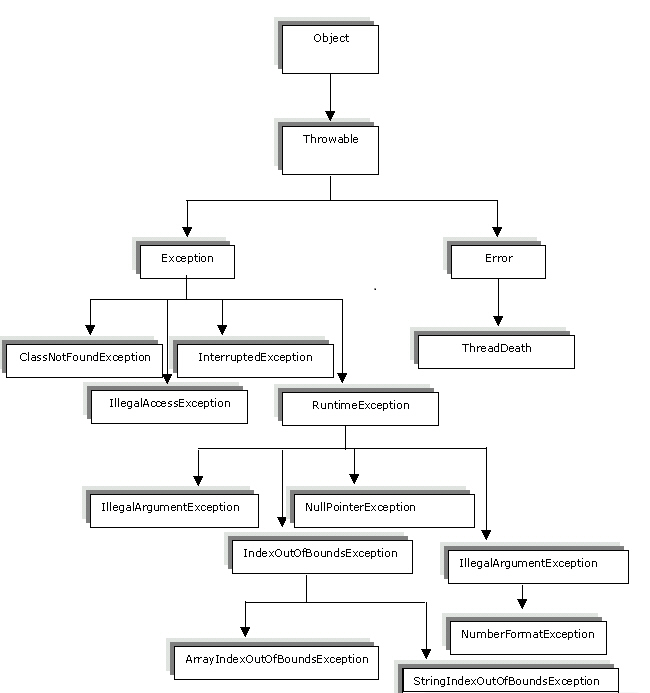 The try block contains a block of program statements within which an exception might occur. A try block is always followed by a catch block, which handles the exception that occurs in associated try block. The corresponding catch block executes if an exception of a particular type occurs within the try block. A try block must followed by a catch block or finally block or both. You can add any number of catch blocks after a single try block. If an exception occurs in the guarded code, the exception is passed to the first catch block in the list. If the exception type of exception, matches with the first catch block it gets caught. If not, the exception is passed down to the next catch block. While using multiple catch statements, it is important to remember that: exception subclasses inside catch must come before any of their super classes, otherwise it will lead to compile time error. try statement can be nested inside another block of try. Nested try block is used when a part of a block may cause one error while entire block may cause another error. In case if inner try block does not have a catch handler for a particular exception then the outer try is checked for match. A finally statement must be associated with a try statement. It identifies a block of statements that needs to be executed regardless of whether or not an exception occurs within the try block. In normal execution the finally block is executed after try block. When any exception occurs first the catch block is executed and then finally block is executed. An exception in the finally block, exactly behaves like any other exception. The code present in the finally block executes even if the try or catch block contains control transfer statements like return, break or continue. The keyword throw is used inside method body to invoke an exception and throws clauseis used in method declaration (signature). In nested try catch, the inner try block, uses its own catch block as well as catch block of the outer try, if required.